John Saxton Houghton married Emma J. Orr in circa 1904 mar 6 y in 1910 census. John Saxton Houghton married Pearl C. Brazelton in 1920 first marriage, age 21, age 28. Maude M. Houghton married (?) Weddle. Hugh James Houghton married Sarah Ellen Long. William Baker married Fannie M. Houghton, daughter of Joab Houghton and Mary Jane Frigitt. Risie E. Loomis married Elmsley H. Houghton, son of Henry Bartlett Houghton and Nora Cook, in Dec, 1883. Addie E. Whitney married George Morris in Mar 17, 1892. Oscar Nathaniel Whitney married Lillian Walton in Jul 14, 1894 at Sterling, MA, USA. William S. Whitney married Alice M. Wiggins in Feb 15, 1888. George Morris married Addie E. Whitney, daughter of Nathaniel Bradish Whitney and Ruby N. Houghton, in Mar 17, 1892. Alice M. Wiggins married William S. Whitney, son of Nathaniel Bradish Whitney and Ruby N. Houghton, in Feb 15, 1888. 1900 Census 1900 Delmore, McPherson Co., KS, USA, age 31, music teacher; two houses fromr sister Fay G.
Fredrick Houghton married Ettie Hodges in Jan 26, 1898 at Roxbury, McPherson, KS, USA. Truman Hurlburt Houghton Jr married Margaret E. Grosse in Jun 13, 1907 at Kalama, Cowlitz Co., WA, USA. Truman Hurlburt Houghton Jr married Martina Holmberg in Dec 15, 1910 at Salina, Saline, KS, USA. Fay George Houghton married Lena Bell Cadby in circa 1904 at KS, USA, married 6 years in 1910 census. Nathaniel Braddish Houghton married Neva Elizabeth Charles in Jan 15, 1923 at Pikeville, Pike, KY, USA, age 45 and 25. Ruth Lusina Houghton married Charles John Brandt in Jan 10, 1898 at McPherson, McPherson, KS, USA. Ruby Naomi Houghton married John Victor Nelson in Aug 30, 1906 at McPherson, KS, USA. Pauline Victoria Houghton married J. Will Houseworth in Aug 22, 1911. Pauline Victoria Houghton and J. Will Houseworth were divorced. Rhoda Magdalaney Houghton married Gottlob Christoff Hauser in Feb 18, 1914 at McPherson, McPherson, KS, USA. Rhoda Magdalaney Houghton and Gottlob Christoff Hauser were divorced. 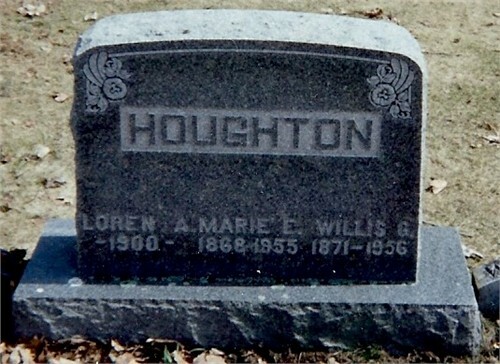 Willis George Houghton married Anna Marie Edghill in Jul 3, 1899 at Lowville, Lewis Co., NY, USA, age 27 and 32.